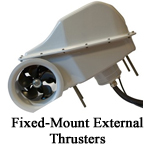 SiderPower's externally mounted thruster systems are the outboard motors of the thruster world. There are retractable and fixed-mount thrusting systems. Retractable thruster units are able to move away from the hull of the vessel to deliver a focused push right where you want it to allow a more controlled thrusting experience. Fixed thruster units mount flat against your hull and are not able to be adjusted. Retractable and Fixed thrusters are available in On-Off and SEP "Pro" Speed Control styles.